Computed tomography (CT) has made impressive progress during the last 20 years. In the 1980s, a slice thickness of 10 mm was common, and a typical study generated a total of 25 to 30 slices. Today, we routinely use a 0.75-mm slice thickness, reconstruct at 0.5 mm, and produce a data set that ranges in size from 400 slices for a standard application, such as single-phase liver imaging, to 3,000 slices for a cardiac scan. Image display has changed radically as well. It is no longer necessary to review a stack of axial images; instead, we can take advantage of volume displays and even four-dimensional motion studies. CT continues to change. Today 16-slice CT scanners may be the state-of-the-art; however, by the end of the year, 64-slice scanners will likely claim that honor. Advances in CT technology mean that contrast enhancement can be used in more sophisticated ways. Sixteen-slice technology enables us to scan the liver, pancreas, or lung in <10 seconds and to coordinate image acquisition and contrast delivery precisely, taking advantage of the information revealed by multiphasic imaging. Isotropic resolution-voxels of equal dimension in the x-, y-, and z-axes-yields another critical benefit of advanced technology. In peripheral vascular imaging, for example, isotropic resolution enables detailed visualiza-tion of small vessels from any imaging plane or perspective that we might select for viewing. Several very practical things are needed for state-of-the-art CT angiography (CTA). The first is a good scanner, and today, that means 16-slice technology. Well-designed protocols are also essential. Equally important, technologists must be dedicated to optimal data acquisition, and radiologists must be prepared to accept nothing less. CT angiography is a zero-tolerance study. Either it is done well, or it is of little or no value. Contrast protocols define the type and volume of contrast to use, the injection rate, and the timing of data acquisition relative to contrast injection. For example, for pancreatic imaging, at our institution we use 120 mL of either Omnipaque 350 or Visipaque 320 (GE Healthcare, Princeton, NJ) injected at approximately 4 mL/sec. scan delay for arterial-phase imaging is 25 seconds, and for venous-phase imaging, 50 seconds. A contrast protocol is very defined and must be implemented the same way every time to ensure successful and efficient operation. Scanner-specific protocols are equally important. These define detector collimation, slice thickness, interscan spacing, kVp and mAs, and the timing of injection and data acquisition. Thus, a typical protocol for pancreatic imaging specifies a 120 kV, 140 to 200 mAs, a 0.75-mm detector collimation, a 0.75-mm slice thickness, and incremental reconstruction at 0.5 mm. State-of-the-art CTA also demands good postprocessing tools, whether on the scanner or at the workstation. It is important that radiologists have regular hands-on experience at the workstation. Those who are reluctant to do so will not excel at CTA. The information in a CT scan is not fully appreciated by viewing axial slices. Extracting such information requires volume visualization. The left adrenal vein offers a good example. This vessel is roughly 1 mm in width and, on axial slices, appears to be no more than a dot. On a three-dimensional (3D) volume display, however, the adrenal vein can be seen clearly (Figure 1). The importance of volume displays will become even more evident with the introduction of 64-slice CT scanners. More and more slices will only increase the potential for extracting information from data sets and displaying it as a volume. The preference for volume displays is not limited to radiologists. Referring physicians want critical information that allows them to manage patients. A single volume display represents hundreds of axial slices and often provides all the information the referring clinician needs. At our institution, we have found that even surgeons with many years of experience request only 3D images for preoperative review. Most scanners now are able to do many different rendering techniques, including maximum-intensity projections (MIPs) and volume renderings. Each type of volume display has advantages and disadvantages. For example, in Figure 2, the renal vessels are nicely shown with both the MIP and the volume-rendered technique (VRT), but there is better definition of the cortex and medulla with the VRT. The clinical applications of CTA span from the top of the head to the bottom of the feet. In the head and neck, these include the detection of intracranial aneurysm and definition of its extent (Figure 3), as well as evaluation for carotid stenosis. In the abdomen, CT is steadily ex-tending its capabilities in the pancreas, liver, kidney, bowel, and aorta and branch vessels. In examinations of the liver, timed acquisitions and arterial-phase imaging accentuate the presence of hepatic tumors, enable arterial mapping of feeding vessels, and permit detection and staging of gastric and esophageal varices in patients with cirrhotic disease. In many cases, a single study can detect disease, define the extent of disease, and guide the selection of therapy. In the kidney, CTA provides an excellent opportunity to define arterial and venous anatomy, including abnormalities that are easily overlooked on axial images. It ably evaluates patients with renal stenosis and those who have undergone stenting of the renal artery. In addition, CTA and 3D mapping are quickly becoming the standard of care for evaluating suspected, or known, renal masses. 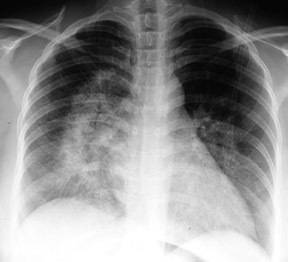 In the chest, pulmonary angiography is a key application. Whether the display is a VRT or MIP, the amount of information available from a typical data set is very impressive. 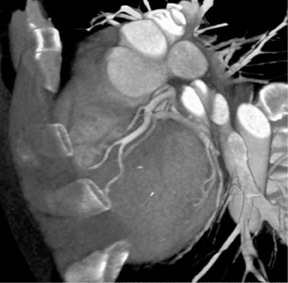 Cardiac imaging is one of the most exciting applications of CTA, particularly since the introduction of 16-slice scanners. 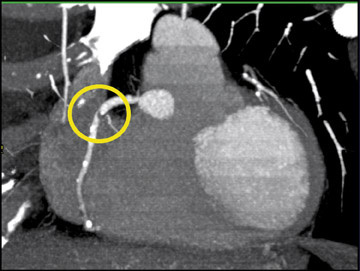 Retrospective gating of data sets enables detailed examination of the coronary arteries (Figure 4). With the introduction of 64-slice scanners, cardiac CT will be an area of tremendous change and opportunity. CT angiography of the peripheral vasculature continues to excel. From the iliac arteries to the femoral arteries through the trifurcation, the detailed depictions of vascular anatomy are unprecedented and superb. For this reason, CTA is replacing conventional angiography in up to 90% of studies of the peripheral vasculature. CT angiography is expanding beyond the imaging of atherosclerotic disease to imaging patients with infection. Thin-section data sets can define inflammation, depict tendons and muscle, and examine detailed arterial structures, even down to the smallest branches. As scanning technology advances, careful contrast administration becomes even more important. Precise timing of contrast delivery and image acquisition yields new information previously unavailable with CT.
With its ability to perform comprehensive examinations from head to toe, CT angiography is reshaping the practice of radiology. Patterns of referral are changing and, with them, the way referring physicians use radiology and interact with radiologists. Adapting to these changes requires modifications in workflow, changes in processes, and improvements in skill sets. This is a time of both challenge and opportunity. I hope this article shares this excitement with you. ELLIOT K. FISHMAN, MD: Does anyone have any additional comments based on your personal experience with CTA? GEOFFREY D. RUBIN, MD: I think that you have hit upon many of the important points, Elliot. Certainly, we are just midway through the journey in seeing what role CTA will play in the practice of clinical radiology. The newer scanners, and the ones that we will be seeing a few years from now, are really going to challenge us in terms of how to optimally acquire the data sets. I think that what we have seen thus far has been the development of applications that have enabled us to expand the use of CTA to larger parts of the body and different vascular territories. But as we have broken virtually every barrier to CTA, leaving maybe just the heart as an area that still presents challenges to us, we now have to bear down upon the advancements in technology and realize the advancements in the image quality and the diagnostic utility of these tests. We have to see how we go from here to optimize the use of contrast, 3D rendering, etc., to really take advantage of what tomorrow brings with these CT scanners. FISHMAN: I'll ask each of the panel members this question. Many people have not really put CTA into practice, although they have state-of-the-art scanners. Often it is the process of getting started that is the problem. Once you get started, it is kind of easy. What advice might you give somebody first getting started in doing CTA? RUBIN: In my opinion, the most important aspect in getting started is to work with your clinicians and get them engaged in what you can do. In the end, they need to realize the benefits of what you are providing, so clinical partnerships are really critical. I would advise most radiologists to pick a specific area to "cut their teeth," if you will, on CTA, perhaps something in the abdomen or in the chest. Then, I suggest they work with a focused group of clinicians until they are confident that they can get good-quality studies. Then the clinicians become your greatest advocates through the hospital. 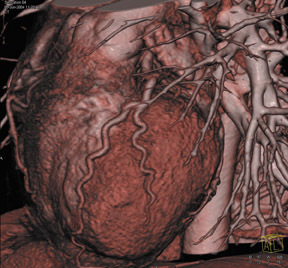 You want to be able to provide 3D visualization efficiently and effectively so that the clinicians can show their colleagues what can be done with CTA. Then, with that initial kernel of clinical activity and progressive referrals, it will expand into other services. W. DENNIS FOLEY, MD: I think you also need to make sure that the technologists in the CT area are happy with the scanners. But you also must make sure that there are 1 or 2 technologists who have more expertise, particularly in relation to the types of protocols you would want to use for CTA. You would probably want to select 1 of those technologists to be a champion of the workstation, because I do not believe that the radiologists can do it all at the workstation. There are certain quantitative analyses and rather sophisticated 3D that will still require the "supertech" to do it. Radiologists will progressively gravitate to using 3D more once they have 3D integrated with their PACS. But in most practices right now, 3D workstations are separate from the PACS. I think everybody recognizes that it is really not the way it should be. But we will still need a supertech, the person you selected originally, to be the champion of doing the 3D, to really wow the clinicians. FISHMAN: I think our experience is very similar. We have approximately 20 technologists in the practice; in the beginning we had 1 or 2 techs do CTA to make sure that it was really done perfectly; you have no second chance to do it well. Then we had the other techs involved. One of our senior techs is one of our best advocates. He will put the images on the satellite console and, literally, will show them to every person that walks into the CT suite. So now everyone knows that we do CTA, and I think that was a very big way of really getting the information across. So I agree that the technologists are super critical; probably more now than ever. U. JOSEPH SCHOEPF, MD: I agree with everything that has been said. If radiologists are about to start their CTA business, they must develop strategic partnerships with their clinicians. What always strikes me is how fast technology evolves. It is difficult enough for radiologists to keep a handle on what is happening with imaging technology, and it is even more difficult for the clinicians out there. So, I believe it is incumbent upon us as radiologists to go out there, penetrate medical meetings, penetrate surgical meetings, and educate people about what CTA can do. We need to make people aware of what we, as radiologists, have to offer them. I probably have an easier time talking about thoracic CTA applications, particularly pulmonary CTA, because that is a reality in most practices. But as we venture into new territory, such as peripheral CTA that Geoff will talk about, that is really where a lot of education is needed, both in the radiology and general medicine communities. FISHMAN: True. I think you also made a very important point in that one of the problems radiology has had in terms of PR or getting information out to our referral base is that radiologists speak to radiologists and surgeons speak to surgeons. Many surgeons are doing radiology in 2004 like it was done in 1993, back when they finished their residency. I think radiologists need to speak at surgical meetings. Many of us have spoken at those meetings and they are actually some of the most worthwhile presentations because when you speak to radiologists, the audience may think "been there, done that." When you speak to surgeons, it's amazing to discover the limited range of radiology that is actually practiced in the community. I think that one of the ways that radiology will keep its franchise is by showing people what we can do. I think people really do not understand how difficult the studies are to do, nor how much effort we put in to do it. It is not like you can just go buy a scanner, put it in down the street in an office, and you are doing radiology. I think that's a great mistake. In March 2004, The New York Times reported that approximately 20 MRI scanners have been installed in Syracuse, NY in the last 18 months. Not one of them was purchased by a hospital or a radiology group. But by clinicians who thought they could do their own MR, and rationalized it to the paper by saying "Why should the patient cross the street to get an MR?" One of the things we can do is really get information out about what radiologists can do. I know GE Healthcare does a lot of educational material focused in radiology, and, individually, many of us do it well at our institutions. But it often doesn't spread beyond there. BRIAN R. HERTS, MD: I agree with everything that has been said and I would like to reiterate two points. I totally agree with Geoff that starting with one area is the best way to begin to do CTA. That is how we started ourselves. We picked one focused area, learned it very well, worked closely with the clinicians, and took it from there. The second thing I would like to add is the importance of the 3D rendering in this process. If you compare lectures today with what you presented 15 years ago, you realize what an effective form of communication 3D rendering is. Every image you see in lectures nowadays is a 3D image. Why? Because it takes just one image to communicate the information, as opposed to a series of axial images. But it is not just the 3D workstation; it is the contrast, the protocols, and the 3D software that all go into making that image. LEO P. LAWLER, MD, FRCR: I share the consensus. There are a number of steps that I would reiterate and maybe expand slightly. In addition to having a good technologist, you really need a team approach. You need both the radiologist and the technologist, two people who learn the sophistication of the scanner and develop a kind of vernacular with each other. I think that is the key element. But they need to start off with a resource. For example, the CTA supplement in Applied Radiology last year is very, very useful. It is very important to have that kind of resource that puts everything together. There are a number of publications that do that kind of thing. I agree that it is best to start off with a single region. Static organ imaging, in particular, is a very good way to start CTA. The final thing I would like to add is that the final point of communication requires an anticipated system of communicating and networking, particularly digital data. The job roles are switching from angiographers to diagnostic radiologists who now have to learn the interpretative techniques in order to get those images back to the clinicians. Radiologists also have to have realistic expectations; I do not think you can build a practice on peripheral angiography and coronary angiography, etc., and expect to be doing the same work day. If you add those services, you are going to have to invest your time to learn how to do them and spend also your time to perform them. FISHMAN: I think GE Healthcare should be commended for their efforts in supporting technologist education. As you say, unless the technologists are really up to speed and part of the team, none of this works. Although we will not be speaking about workstations and PACS stations in detail today, we all recognize that the technology is constantly changing. One of the critical issues in CTA is the quality of the data sets, and that is really where contrast comes in. Obviously, unless you have contrast in the right place at the right time, the data sets are just not going to happen. So, in the presentations today we will address that more specifically for each application: how do we optimize contrast delivery, data acquisition, and contrast selection. CT angiography: the state of the art in 2004. Appl Radiol.